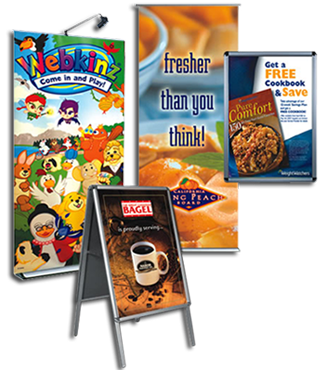 Our large format, signage and banner printing is perfect for ad campaigns, trade show exhibitions or in store promotions. Create awareness about your company or your product on a large scale! All our banners and signs are suitable for indoor or outdoor use. We can supply PVC banners, canvas or mesh banners and vinyl cut banners. Still Creek Press Studio CraftedTM signage is output and finished with the very same attention to detail and quality that we demand for all our litho work. Which means you get the same exacting GRACoL G7 Certified Master Printer colour process controls, rigorous substrate standards, sustainable green printing options and Print Made Easy™ service. Want more information on signage or banner printing? Upload files for large format printing. A member of our sales team will be in contact with you regarding your files. Request a quote. A member of our sales team will be in contact with you regarding your request. Contact us for more information about our banner printing services.